I got a couple more bands done. I'm really enjoying this! 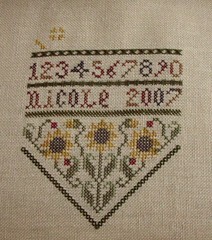 I have it on a scroll frame and I usually stitch in hand, but I'm love the neatness of doing it on the frame. Tonight I'm hoping to get more done... my show is on tonight (Grey's Anatomy) and it's a new one! I can't wait for 9:00! :) Write later! Your bellpull is stitching up quickly. Looks nice. The bellpull is looking great, you will have it done in no time at all. This is looking great...I was thinking of doing this someday, seeing yours it may be sooner than later. I too stitched and watched Greys Anatomy while in MT on business and watched it again on the flight back home to UT. Your stitching always inspries me!